If it’s been years since you felt comfortable showing off your legs, now is the time to do something about it. While many varicose vein conditions are cosmetic, they can lead to more serious health issues. At the Advanced Vein Center, we offer solutions. Sclerotherapy is a simple and effective, noninvasive procedure for small varicose veins. The Procedure Sclerotherapy is the most common way to treat small to medium varicose and spider veins. In this procedure a solution is injected into the varicose vein causing the vein to be reabsorbed by the body. This is a simple office procedure that only takes 30-60 minutes. In some cases repeated treatments may be necessary. After treatment, you will be required to wear compression stockings for a short duration to assist with the reabsorbtion of the spider veins. Walking immediately after the procedure is encouraged. Before treatment, a complete medical history is taken and a thorough medical examination is conducted. This is done to determine how long the problem has existed, the severity of the symptoms, and whether or not the condition is affected by physical activity. It is also done to see if you have undergone prior surgery or other vein therapy. At this time, the physician assesses if your deep vein system is affected. If so, he or she may recommend that you have another procedure prior to undergoing sclerotherapy. The Advanced Vein Center will provide comprehensive patient preparation guidelines to optimize your vein treatment experience. Reduces or eliminates unsightly veins. Patients who have had sclerotherapy have reported little discomfort. Some experience a slight to moderate burning sensation immediately after the injection, but this disappears within a few seconds. An ointment to soothe the skin and relieve the burning may be used, and a pressure bandage may be applied to prevent post-injection bleeding. Some physicians prefer to use compression stockings. Others use compression bandages. Sclerotherapy patients are generally advised to return to normal daily activity immediately following the procedure. Vigorous physical activity, however, is discouraged for 24 hours. Walking immediately after sclerotherapy is encouraged because it increases blood flow through the remaining healthy veins that bring blood back toward the heart. Elevating the legs usually isn’t recommended unless large varicose veins have been treated. Most patients experience no adverse effects from sclerotherapy, but some minor side effects have been reported. These include slight blistering that occurs when small amounts of the injected solution seep into the surrounding areas. This usually goes away with time, and additional treatment with bleaching agents can help. Bruising around the treated area can result if the veins are unusually weak, but this eventually disappears. Fair-skinned people tend to bruise more than dark-skinned people. Clots sometimes develop at the injection site. Although not a major cause for concern, it may be necessary to remove these clots within two weeks to better allow the healing process to progress normally. A small percentage of patients develop a network of tiny pink vessels that turn white when pressure is applied. This condition, referred to as matte telangiectasias, usually disappears without treatment, but sometimes injection treatment is needed. Occasionally, patients have allergic reactions to the injected solution. When this occurs, antihistamines and other medications are prescribed to offset the reaction right away. When large varicose veins are treated, wearing compression stockings is recommended to prevent recurrence. 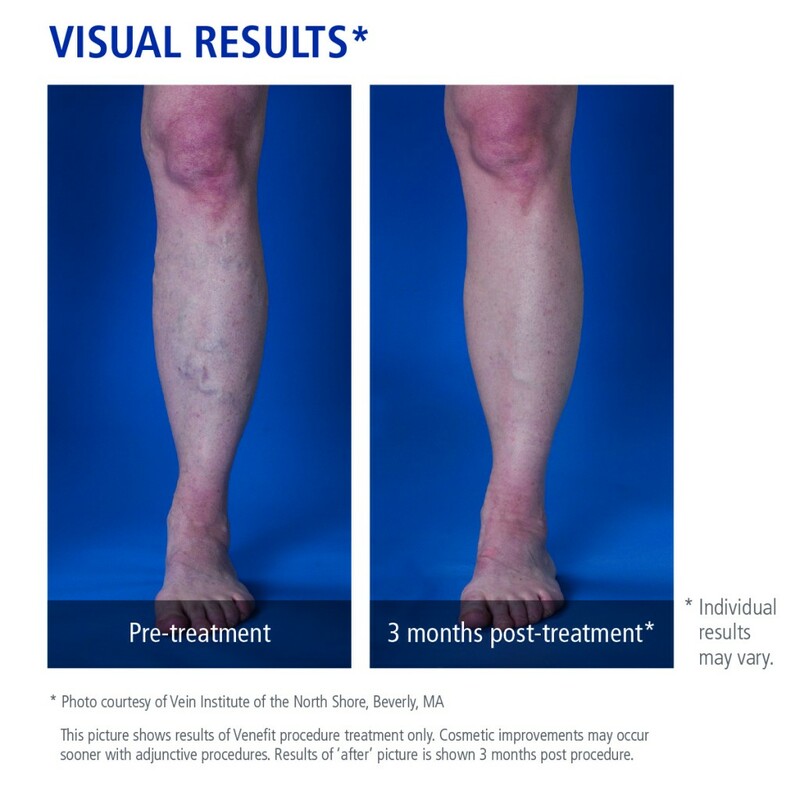 We proudly offer the Venefit™ procedure, formerly known as the VNUS Closure™ procedure, for the treatment of varicose veins and CVI. The Venefit™ procedure is a minimally invasive segmental ablation treatment that utilizes radiofrequency (RF) energy to provide an even and uniform heat to contract the collagen in the vein walls, causing them to collapse and seal. Once the diseased vein is closed, blood will re-route itself to other healthy veins. NOTE: Reference materials are below. c. Almeida JI, Kaufman J, Göckeritz O, et al. Radiofrequency endovenous ClosureFast versus laser ablation for the treatment of great saphenous reflux: a multicenter, single-blinded, randomized study (RECOVERY Study). J Vasc Interv Radiol. 2009;20:752-759.
d. L. H. Rasmussen, M. Lawaetz, L. Bjoern, B. Vennits, A. Blemings and B. Eklof, Randomized Clinical Trial Comparing Endovenous Laser Ablation, Radiofrequency Ablation, Foam Sclerotherapy and Surgical Stripping for Great Saphenous Varicose Veins. British Journal of Surgery Society Ltd., Wiley Online Library, www.bjs.co.uk, March 15, 2011.
e. Proebstle T. et al. Three-year European follow-up of endovenous radiofrequency-powered segmental thermal ablation of the great saphenous vein with or without treatment of calf varicosities. JVS; July2011. Recent technical advancements in laser therapy have provided vein treatment solutions that are non-invasive, relatively pain free, and can be completed in an office setting. The Advanced Vein Center offers Endovenous Ablation, a state-of-the-art varicose vein treatment option. Endovenous Ablation is a quick, minimally invasive alternative to traditional vein stripping. It leaves minimal scarring and is performed under local anesthesia in our office. It also features a short, relatively pain-free recovery time. Prior to treatment a physical examination using an ultrasound machine is completed to map out the vein to be treated. The treatment itself takes less than an hour. First, the area to be treated is numbed with a local anesthetic. Then a thin laser fiber is inserted into the vein, using a tube called a sheath. Once the fiber is positioned properly, laser energy is applied as the physician slowly pulls the fiber through the length of the vein. Delivered in short pulses, the laser energy heats the vein from within, causing it to shrink, collapse, and seal shut. Once it’s sealed, healthy veins take over and redirect blood flow back toward the heart. Walking immediately after the procedure is encouraged, and you can return to normal daily activities within a week. Strenuous physical activity, however, should be avoided for three to four weeks. You may experience some bruising or soreness for seven to ten days. Walking or taking over-the-counter pain medication helps relieve any remaining discomfort. Your physician may prescribe an anti-inflammatory for you. After endovenous ablation, you’ll need to wear compression stockings for about two to four weeks. You should walk immediately after the procedure. Returning to normal daily activity is encouraged, though vigorous physical activity such as visits to the gym should be avoided. You may have some bruising and soreness for seven to ten days after the procedure. Taking over-the-counter, non-aspirin oral pain relievers as needed will reduce the pain and the bruising. View the complete patient preparation and post procedure instructions. Clinical results that document the success of endovenous laser treatment for varicose veins have been published. Still, as with any medical treatment, endovenous laser therapy has certain risks that your physician will explain in terms of how they apply to your individual case. Endovenous ablation successfully treats venous reflux, the cause of most varicose veins, but keep in mind that additional therapy is needed in some cases. The laser energy heats the vein walls, which damages them and makes them shrink. This causes the faulty vein to collapse and stops blood from flowing through it. There is no reason for concern, however, because the body automatically uses the healthy veins remaining in the legs to return blood to the heart. 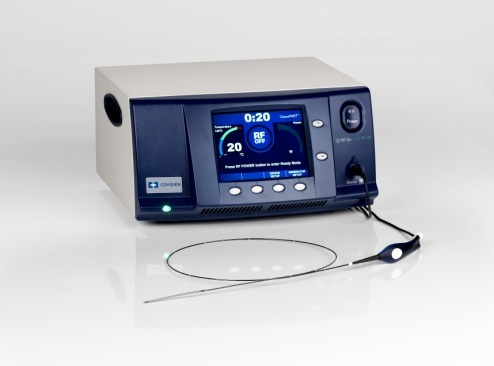 There are potential complications with any medical procedure, but only minimal complications have been experienced with endovenous laser therapy. Potential complications include vessel perforation, thrombosis, pulmonary embolism, phlebitis, hematoma, infection, paresthesia (numbness or tingling), and skin burns. Insurance coverage for the procedure is determined on a case-by-case basis. In most cases, insurance companies decide whether or not to cover treatment based on medical necessity. The Advanced Vein Center will work with you and your insurance company to determine your coverage options. How successful is endovenous ablation? Early results have been extremely favorable. In fact, success rates have been as high as those for the conventional surgical approach, which is accepted as the “gold standard” treatment. Endovenous laser therapy generally treats most varicose veins successfully, but additional therapy is needed in some cases. For heavily damaged varicose veins, vein stripping may be the appropriate treatment path. Until recently, vein stripping was the standard treatment for large varicose veins. 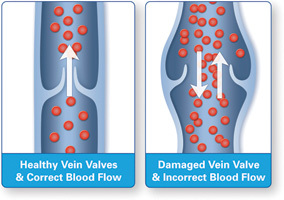 Today, it may be necessary if the veins or the valves within them are heavily damaged. Vein stripping is a surgical treatment that is performed in the hospital or surgical center, but you can return home the same day. 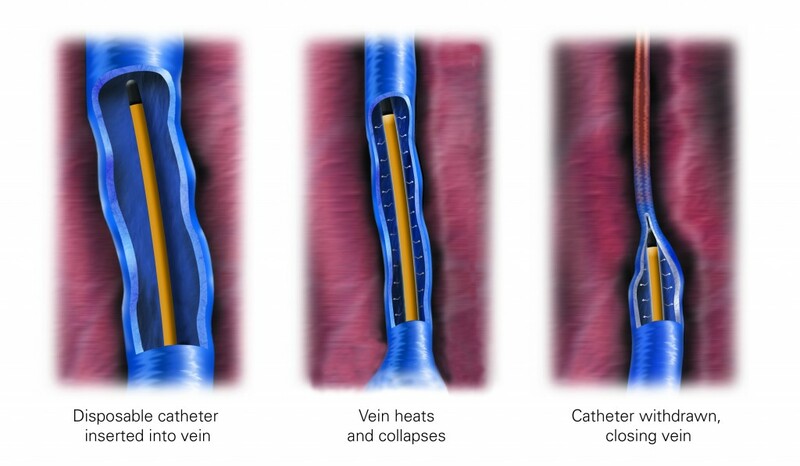 In this procedure, the target vein is closed off above and below the problem area, and an instrument is used to pull out the damaged vein. Blood flow continues, using the healthy veins that remain. After your procedure it is important to keep your legs elevated when you’re sitting or lying down. Walk as much as you can, starting the day after surgery. Elevate the legs after walking to prevent swelling. You’ll also need to wear an elastic wrap or compression stockings after surgery. Your physician will tell you when you may return to work after the procedure. View complete vein stripping surgery patient preparation and post procedure directions. Side effects from vein stripping surgery include temporary pain or discomfort, bruising, hematoma, and numbness. Is vein stripping covered by my insurance? Insurance coverage for surgery expenses depends on many factors and should be looked into on a case-by-case basis. The Advanced Vein Center will work with you and your insurance company to determine your coverage options. in the veins — causing them to stretch, enlarge, and widen.